Whether it is because of fear or disgust, Millennials do not use the telephone for placing and receiving phone calls very often. When a call comes in to the cell phone of a Millennial, they look at the corresponding screen on their phone in their hand as if to certify that the call was just one of those annoying robo-calls that everyone seems to get. That actual communication could occur through the function of a telephone is beyond today’s youth, which prefers to send messages via digital methods requiring typing – texting, Facebook entries or Snapchat posts, the best social media site for people who don’t want their parents sniping on their handiwork. Millennials prefer to communicate with professional advisors the way they communicate with all other people in their life--through vehicles that did not exist 20 years ago. Two factors affect the communication habits of Millennials: social media and smartphones. When seemingly immediate communication can take place via typing onto a social media site or onto a cellphone in the form of texting, Millennials are going to choose that option. Advisors need to be ready to accept and respond to those types of communiques. According to Spectrem’s new study Advisor Communication, almost 30 percent of Millennials and even 10 percent of Gen X investors have communicated with their financial advisor through Facebook. That probably means the investor has commented on a post the advisor placed on Facebook, which is an indication that the communication started with the advisor. Since communication between advisor and investor is considered desirable, advisors should note that there is an advantage to starting a conversation through social media. Fourteen percent of Millennials have also communicated with their advisor through Twitter which is actually a more conversational social media website than Facebook is. The use of Twitter for conversations with advisors drops to almost zero when considering the Gen X generation or older investors. 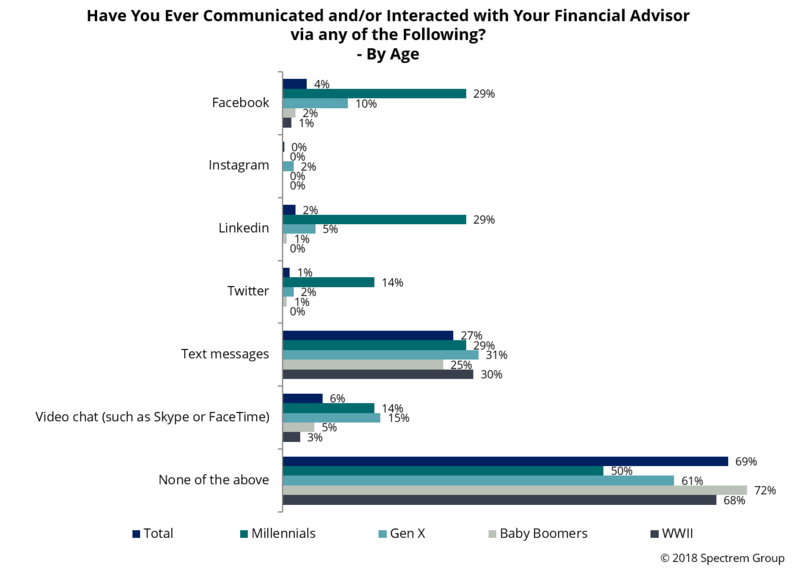 Millennials are also the most likely to communicate with their advisor via text, although the interest in such form of communication is not overwhelming. Asked to place their interest on a 0-to-100 scale, Millennials placed their average rating at 43.40, close to 10 points higher than scores from Gen X investors and Baby Boomers. Overall, the interest was at 32.02, which is a poor to middling rating. Millennials are also willing (to a degree) to communicate with advisors through video-chat services like FaceTime or Skype. Their rating for such an opportunity was at 35.47, a notch higher than the overall view of texting among all investors. With all of that being said, Millennials would most likely look to their email accounts to get an introductory note from their advisor about a new investment product. Forty-one percent of Millennials said they wanted a new product offering to come in an email with a link to a website presentation, while 26 percent said they wanted to hear about a new product in an in-person meeting. There is no one correct way to communicate with investors. Some investors want hard copies of account summaries and product sales pitches, some investors want everything coming in on email, and others want to communicate the easiest way possible, which is often through texting or social media. Anything that can be accomplished via smartphone is considered the easiest, and advisors need to be able to respond to communication that comes through on all of these forms. There are still regulatory prohibitions on some topics related to investment decisions and how they are communicated. Advisors need to be upfront and transparent about those prohibitions so that investors do not have undue expectations of communication avenues.